To make the most of your tan remember to use an after sun product. It is specially formulated to cool and soothe sun exposed skin and helps ensure a long-lasting, beautiful tan. 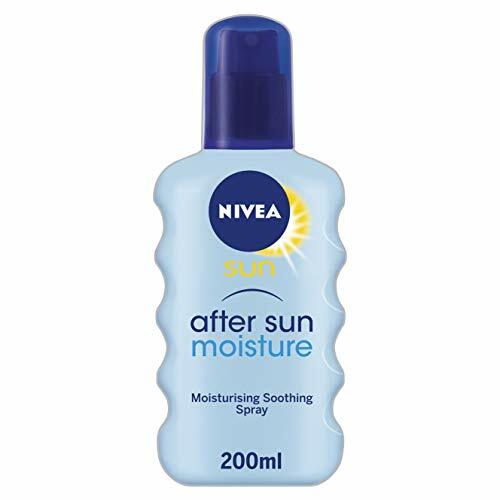 NIVEA SUN cooling after sun spray combine NIVEA SUNandrsquo;s advanced protection expertise with all the mild care of NIVEA to protect skin.NIVEA SUN cooling after sun spray is enriched with aloe vera and pro-vitamin B5 to moisturise and calm the skin. It is easily absorbed by the skin. The vitamin E combat harmful free radicals and premature skin ageing. The up-side-down pump makes it easy to reach those awkward spots. NIVEA SUN cooling after sun spray is dermatologically approved.The sun protection factor (SPF) gives an indication about the degree of protection against sunburn. As the SPF increases, the amount of sunburn including UVB radiation that reaches the skin is reduced. The SPF should be chosen depending on the skin type, season, location and time of the day.NIVEA SUN cooling after sun spray gives immediate protection against harmful sun exposure. Its long lasting effect will keep your skin healthy and moisturised. It is water resistant and have an excellent UVA/UVB protection system. The disappearing coloured spray ensures even coverage of the skin.